Many notable politicians, successful business people, war heroes, and inspiring educators have lived in the Blue Mountains at one time or another. One of these was renowned geologist, polar explorer and university lecturer Sir Tannatt William Edgeworth David K.B.E., C.M.G., D.S.O., D. Sc., F.R.S. with wife Caroline. The couple purchased twenty-six acres of land at Woodford in 1898, naming the two-roomed cottage they built ‘Tyn-y-Coed’ (meaning house in the wood). The name reflected Sir David’s Welsh birth. Born in 1858 at the rectory of St Fagan’s in Wales, he was the eldest child of Rev. William David a fellow of Jesus College Oxford. Sir David graduated B.A. from Oxford in 1881. He arrived in New South Wales to take up the position of assistant geological surveyor following the disappearance of Lamont H. Young (his predecessor) on a field trip to Bermagui in 1880. Sir David arrived in Sydney in 1882 and in July 1885, married English born Caroline Martha (Cara) Mallet whom he met on the voyage to Sydney. There is a suggestion that Cara emigrated for reasons of health, however it is more commonly suggested that she came to NSW to take up an appointment as founding principal of Hurlstone Training College for female teachers. Interestingly, she is thought to have been appointed by Sir Henry Parkes. Cara, an orphan from a working class family, received her education by scholarship from Whiteland College London and later, she trained as a teacher. She was a lecturer at the college prior to applying for the position at Hurlstone. Cara, a bright intelligent woman, became interested in and assisted with the introduction of the free kindergarten movement in the inner suburbs of Sydney. She was aided by other early feminist educators like Louisa Macdonald and Maybanke Wolstenholme. 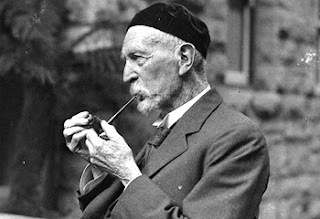 Sir Edgeworth David was appointed professor of geology in the University of Sydney in 1891. Sir Ernest Shackleton appointed him as leader of the scientific team accompanying him to the South Pole in 1907-9. Sir David led the party that discovered the South Magnetic Pole and he and his team scaled the active volcano Mount Erebus. At the outbreak of the First World War, Sir David recruited and formed the Australian Mining Corps that was composed of tough individuals from the gold, copper, coal and silver mines of Kalgoorlie, Bendigo, Tasmania and South Australia. Although little is known about the corps the most successful operation carried out by the men serving under Lieut-Colonel David was the mining under and explosion of Messines Ridge, in 1917. In the early part of the twentieth century the Blue Mountains and ‘Tyn-y-Coed’ became the David’s main place of residence. The cottage was expanded to meet the needs of the family and orchards and gardens were established. In 1909, following his return from the Antarctic, the Davids entertained the crew of the polar expedition ship, Nimrod. The Davids were community minded and sociable and members of the local Woodford Anglican Church. In August 1934 the media of the day announced the death of the world famous scientist. Sir David was given a State funeral. It is unfortunate that the crumbled chimney stack of ‘Tyn-y-Coed’ (destroyed by fire) is the only reminder of the David’s time in Woodford. * The Journal of the Women’s College, Vol. 26 No. 1, winter 2010-11-09, p. 8. * T.G. Vallance & D.F. Branagan, ‘David, Sir Tannatt William Edgeworth (1858-1934),’ The Australian Dictionary of Biography, Volume 8, Melbourne University Press, 1981, pp 218-221. * Ken Goodlet, Hazelbrook & Woodford, Ken Goodlet, 2006, p 40. * Jennifer Carter, Portrait of a Lady: Caroline Martha David, National Library of Australia, September 2002, Vol. XII No. 12. This article appeared in The Mountain Blueberry, Dec/Jan, Issue 26, p. 20.